The Dell External USB Slim DVD +/– RW Optical Drive is a plug and play disc burning and disc playing solution that you can use with a USB port. KIT-Dell USB Slim DVD±RW drive - DW316 -S&PThe Dell External USB Slim DVD +/– RW Optical Drive is a plug and play disc burning and disc playing solution that you can use with a USB port. 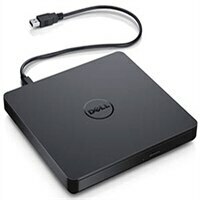 Play or burn DVDs or CDs at home or on the go with the Dell External USB Slim DVD +/– RW Optical Drive. Simply plug the low profile (14mm), lightweight (200g) drive into your Ultrabook or notebook's USB port and you'll be ready to play or burn your favorite DVD or CD at home in even a small workspace. Or, place the drive in your bag to take this functionality with you. The drive is easy to use with pre-loaded software and USB power. Take advantage of the pre–loaded CyberLink Media Suite to easily play and burn DVD/CDs, or install disc–based computer programs. Play or burn your favorite DVDs or CDs with the Dell External USB Slim DVD +/– RW Optical Drive. This premium, external optical drive is powered by your Ultrabook's or notebook's USB port, so no batteries or power cords are necessary. The Dell External USB Slim DVD +/– RW Optical Drive has a streamlined design. 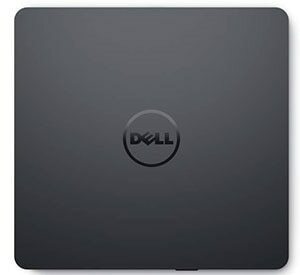 The Dell External USB Slim DVD +/– RW Optical Drive has a streamlined design, which compliments contemporary notebooks and blends in well with your home workspace or a high tech café. Purchase with confidence and rely on the protection of a 1–Year Limited Hardware Warranty for your Dell External USB Slim DVD +/– RW Optical Drive.